The 6 CS Panoramique sedan debuted in 1934, introducing small quarter windows to the A-pillar in order to improve outward visibility (hence the “Panoramic” name). 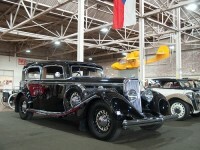 This car would have been considered a high-end luxury car of its time. 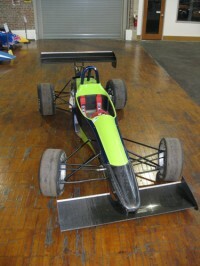 In 2000, Martin Ogilvie designed a car for the British Hillclimb series. This series has one rule - engine size. 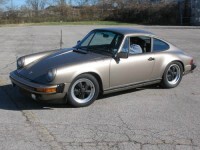 Martin focused on making the car as light as possible (460 pounds) and took every aspect of this car to the edge. The main business of Peel Engineering Company, located on the Isle of Man, was making fiberglass molds for motorcycle fairings and boat hulls. In 1955, the company entered the car market. 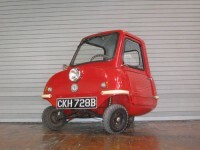 Peel Engineering holds a unique place in automotive history for producing the world's smallest car (P-50) and the world's smallest 2-seater car (the Trident). 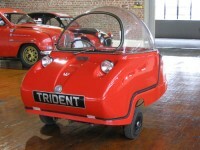 The Peel Trident was an evolution of the P-50. It was made slightly larger to accommodate two modest-size adults. In 2010 several people joined forces and again began producing both the P-50 and Trident.They were able to use the original Peel name because the trademark had lapsed. The 2013 Trident seen here is from the new Peel Engineering Company in England. 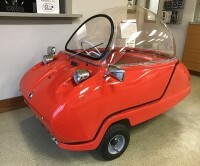 Most people associate Peel Engineering with the building of fiberglass bike fairings and microcars. 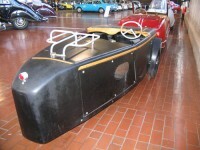 Peel also made a couple of different car models based on then-current production cars’ running gear. The Peugeot 202 was the smallest car made by Peugeot in the pre-WWII era. 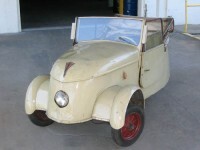 This particular model has a large convertible top, and the model was known as the Berline Decouvrable. Peugeot is one of the oldest car makers in the world, with production beginning in 1890. Peugeot was also a prosperous bicycle maker before going into the automobile industry. The 205 is often heralded as the car that saved Peugeot. 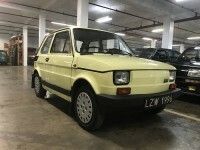 This small, front-drive platform was available in many varieties – 3-door hatch, 5-door hatch, cabrio, and even as a tall-body commercial vehicle. During the second World War, much of Europe suffered from the lack of gasoline. Peugeot, like many other manufacturers, made a few electric vehicles. Known as the APE (ah-pay), Italian for “bee”, this little three-wheeled workhorse often found itself as busy as its namesake. Prior to WWII, Ferdinand Porsche was selected by Hitler to design “the people’s car”–the Volkswagen. 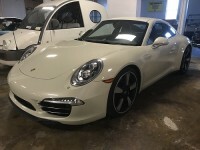 During the war, Porsche fled to Austria. It was during this time that he designed the 356. In1950, he returned to Germany. Porsche’s first post-war model was the 356 (named as the 356th project off his design desk).